Circling the dark side of the moon could be regarded as the ultimate act of isolation, but for Michael Collins, the “forgotten” astronaut of Apollo 11, the modern day cult of celebrity is much darker. When they were launched into space 40 years ago, Neil Armstrong and Buzz Aldrin were hurled into the unknown, circling around in a spaceship to unearth the mysteries of an infinite territory. On their safe return to planet Earth, they had become the very thing they had been exploring – stars: overnight sensations, catapulted into worldwide eminency almost as quickly as they had been catapulted into orbit. 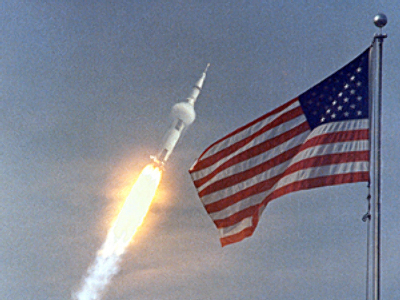 Man’s first footsteps on the moon were a victory for America and one that has deepened in American patriotism with each passing year. As Americans’ fervently rejoice the 40 year anniversary of Apollo 11’s successful mission this week, one man quietly sits back, happy to be out of the limelight now as he was 40 years ago, when he too was launched into space, contributing to NASA’s triumph as much as his two famous compatriots. Far from being a household name, Michael Collins has remained a relatively unknown figure, and has often been cited as the “forgotten” astronaut of Apollo 11. Now, at the age of 78, he fondly reminisces about his role in the first landing on the moon, without any resentment or covetousness towards Armstrong or Aldrin, who have both have been beset with personal problems following their sudden elevation to global notoriety. His two teammates were not so “lucky” in their escape from global prominence. Whilst Neil Armstrong hid under the covers and became a virtual recluse, Buzz Aldrin battled with alcoholism and depression, downfalls that led to the collapse of both men’s marriages. Collins, on the other hand, led a relatively normal life with a stable and long-lasting marriage. Neil Armstrong’s demise into the life of a hermit can be likened to other famous people who crack under the pressure of life under the paparazzi glare and choose a life of solitude and asceticism. The legendary French actress Bridget Bardot, like Armstrong, decided to permanently shut the door to the unfailing public attention she attracted and hid herself away in sleepy French fishing village. Countless celebrities, like the two Apollo 11 astronauts that walked on the moon, are beleaguered to a lifelong battle against drugs and alcohol, unable to cope with the pressure to conform to life in the spotlight. Perhaps the most prominent figure of those who self-destruct as a consequence of a “lonely” existence in the limelight, is of course the legendary George Best, whose love for the “good life” sadly surpassed his talents on the football pitch and eventually led to his death. Even more recently was the hospitalization of Britain’s Got Talent runner-up Susan Boyle, who too cracked under the pressure of becoming an overnight celebrity and had to undergo therapy following the final of the reality television show. Perhaps it is Susan Boyle’s case which really typifies Collins dislike of contemporary society’s “adulation of celebrities”. Whether it was the inevitable aftermath of a mission so wrought with worry and anxiety, or the sheer enormity of being the first human being to walk on the moon, or the subsequent frenzy of worldwide attention the mission created – a whirl that is just as prevalent 40 years later – that led to moon’s first human contacts lapse into personal trauma, we shall never really know. In contrast, the “forgotten astronaut’s” escape from publicity meant he was able to lead a “normal” life, thereby suggesting that media hype that rocketed Armstrong and Aldrin into overnight stardom was the most likely cause of their subsequent torment. So perhaps Michael Collins will be sitting down to watch the Apollo 11 celebrations carousel across the United States this week, enjoying what he recently admitted to like doing “having a really good bottle of Cabernet for under $10”, safe in the knowledge that he had played a fundamental function in the future of astronomy, but without the perils that go hand-in-hand with becoming a household name.